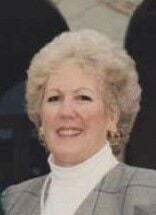 CHARLESTON -- Patty Joan Edwards, 78, of Charleston, passed away Friday, December 28, 2018 at Carle Foundation Hospital, Urbana. The funeral service honoring her life will be held at 12:00 p.m. (NOON) Friday, January 4, 2019 at the Harper-Swickard Funeral Home with Pastor Scott Sims officiating. Burial will follow in Roselawn Cemetery, Charleston. Visitation will be from at 10:30 a.m. til NOON Friday at the funeral home. Memorials: Myasthenia Gravis. Patty was born October 24, 1940 in Yellowhammer, Illinois, daughter of Orville J. and Modesta O. (Price) Lanman. She married Wayne Dean Edwards, December 25, 1958 at her parents' home south of Oakland; he survives. They celebrated their 60th wedding anniversary on Christmas Day. Also surviving are their children: Gary (Brenda) Edwards of West Des Moines, IA, Bryant (Robin) Edwards of Charleston, and Jamie (Kyle) Keefer of Charleston. Seven grandchildren: Monica (Brian) Morgan, Gretchen (Clint) Body, Whitney (Jeff) Oberreiter, Evan (Lindsay) Edwards, Wayde Edwards, Hayden Hoene, and Harrison Hoene; five great-grandchildren: Sierra Morgan, Carson Body, Tyson Body, Hudson Edwards, and Tenley Edwards; as well as four sisters: Helen (Bob) McCarty of McClean, IL, Kay (Mike) Lindsey of Chrisman, Judy (Wayne) Chism of Ashmore, and Vicky (Bob) Edwards of Westfield, also survive. She was preceded in death by her parents, two brothers: Russell Lanman and James “Fluff” Lanman; and one sister: Bonnie Fleming. Patty was a member of Mattoon Christian Church. In her younger years, she was very active in PTA, was a Den Mother, and had been on a bowling team. Patty taught herself to play piano by ear on a piano she had earned by cleaning house for a neighbor, and went on to clean houses for many years for Dr. Hollowell, Dr. Houseworth, Dr. Buchanan, and later Dr. Spaniol. She loved to remodel, paint, and decorate homes. Patty was focused on the needs of her family, and she devoted her life to them.